Denby Boston Spa Teapot. This lot is for a beautiful Denby boston spa teapot. It measures approx 25cm across and 17cm tall. This is in excellent condition as can be seen in the photos. There are no chips or cracks and no damage whatsoever. The lines around the body of the teapot in the images are reflections. There are no scuffs or scrapes to this piece whatsoever! Dispatched with Royal Mail 2nd Class. This retro tea pot dates from the 1970s. LOVELY SAUCER GREYSTONE DENBY NOT RIBBED SEE PHOTO. Denby Regency Blue Hand Crafted Tableware. Sugar bowl. Good condition. Denby Regency Blue Hand Crafted Tableware. Good condition with small amount of surface scratching from use. Made by Denby. I endeavour;. Great used condition. Possibly a second. 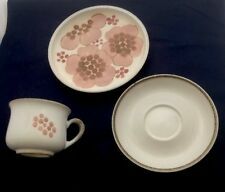 FOUR GREAT DENBY 'MINSTRAL' 8" (20CMS) SALAD PLATES. 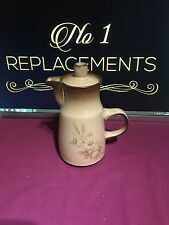 Vintage denby troubadour Tea Set MCM teapot cream jug sugar 2c&s honey jar vgc. Vgc hardly used no damage various back stamps please see photos Dispatched with Hermes Tracked. 4 DENBY POTTERS WHEEL SUNDAE DISHES ON STANDS IN VGC. 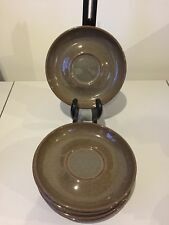 4 DENBY POTTERS WHEEL SUNDAE DISHES N VGC. BOWLS ON STANDS. Large Denby Ironstone Coffee pot. Weight: 1.910 Kg - Height: 29 cm. Small flaw in rim otherwise good condition. RARE DENBY MANOR GREEN EGGCUP. DENBY COTSWOLD SUGAR BOWL. For any one starting out with a blank canvas there is plenty to choose from in living room furniture, glass and china etc. Item(s) can be collected upon clearance of funds. Joseph Bourne & Son therefore bought the Langley Mill pottery in October 1959, for a reported £25,000. Langley Mill Pottery was located in Langley Mill, Derbyshire on the Derbyshire – Nottinghamshire border. DENBY POTTERS WHEEL LIDDED VEGETABLE TUREEN IN VGC. DENBY POTTERS WHEEL LIDDED TUREEN IN VERY GOOD CONDITION. 6 DENBY POTTERS WHEEL DINNER PLATES IN VGC. 6 DENBY POTTERS WHEEL DINNER PLATES IN VERY GOOD CONDITION.